Have you been harnessing the true power of the culinary treat that we know as the taco? This week on Try it Tuesday our SNU testers tried tongue, tripe and beef cheek tacos. These aren’t your normal Taco Bell fillings, so we headed to Taqueria Sanchez located at 4011 NW 10th Street. 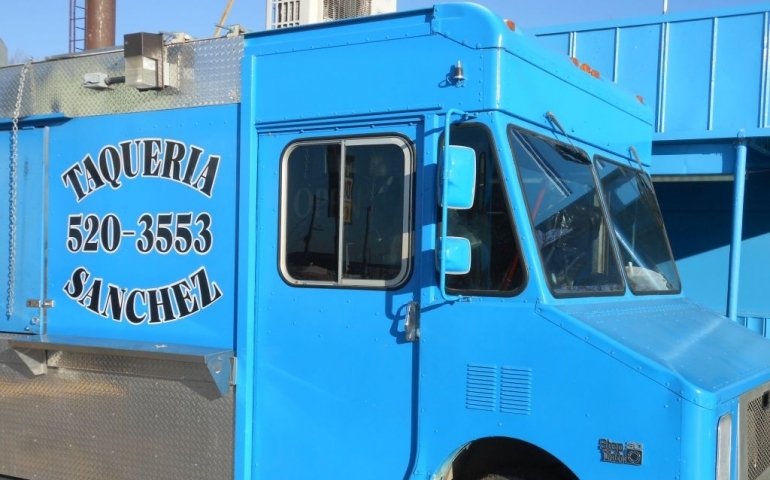 This blue food truck would be easily missed if it weren’t for the group of people patiently lined up for their Mexican fix. Even at 1:30, past the normal lunch rush, people were queued. You know it’s a good place to eat when you see the Oklahoma City Police patiently waiting in line with everybody else. The reason for picking Taqueria Sanchez was that it was highly rated online for both its tongue and beef cheek. The tripe turned out to be an added bonus. Cruelly, I had to slice the tacos in half so that our tasters could try all three types of meat. What worked to my advantage was not everyone knowing what tripe is. In case you don’t know, tripe is made from the stomach of the cow. I know that can sound off putting, but Taqueria Sanchez did a great job preparing it. If you’ve tried it before and didn’t like it, give it one more chance. I am not a tripe fan. While it tastes fine, I find the texture off putting, especially when served in menudo. Taqueria Sanchez fries its tripe, giving it a texture and taste similar to pork rinds. While the tripe was the tasters least favorite of the three meats, it made me a fan of tripe again. Some tasters found it to be gristly and lacking in flavor compared to the tongue and cheek. Not to say that it wasn’t good, just not as good as the others. Both the tongue and cheek garnered the same amount of high praise. Both meats, due to their fat content, can sometimes become too soft if allowed to sit too long, or if they are overcooked. The texture was perfect, akin to a fatty pot roast. While some people wanted to know what the meats were, the more adventurous tasters wanted to test their palate and try and guess what they were eating. Across the board, the tacos garnered praise both for taste and for seasoning. While the seasoning carried a little bit of heat, it was not too spicy for anyone who tried it. Personally, I like a lot of heat, but the flavoring was so well balanced that I didn’t find myself missing it. How much is it going to cost you to put your palate through its paces? Tacos and sodas will set you back a dollar each. The next time you want to order off of the dollar menu, why not travel a little bit farther, down to NW 10th and North Tulsa Avenue and pick up your own tongue taco. Thanks to our tasters this week, Pierson Waugh, Ryan G. Hannay, Zach Sutton, Alexa Srader, Jake Hubbs and Tyler Ray.